I've managed to circumvent my sore ankle (for which I finally broke down and went to the physio - now I've got ankle homework to do and physical therapy twice a week...) and finish off the 8 oz of merino-silk that I dyed for Nana's Christmas present*. Spun/plied at 9.25:1, singles spun long draw from the fold. 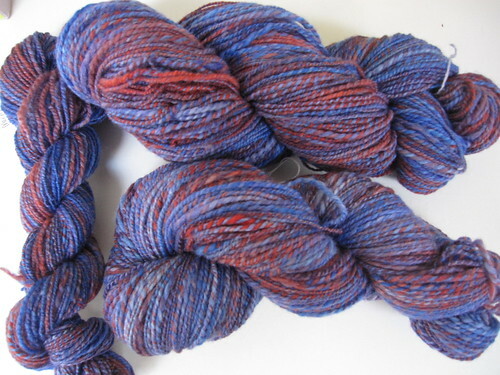 Three skeins, at 397 yds/3.9 oz (1616 ypp), 297 yds/3.1 oz (1536 ypp) and 98 yds/1.0 oz (1568 ypp). 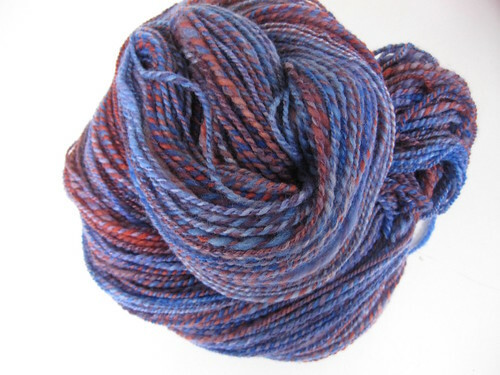 I didn't measure wpi before finishing, but after soaking in hot water and rinsing in cold, the wpi ranged from 27-18 (in the third, overplied skein) to 20-10 (in the first two squishy skeins). I'll be using the two squishy skeins for Nana's present. I was a bit concerned about the intensity of the colors in the dyed top (somehow I managed to forget a photo of the dyed top, but here's some of the singles). The request was for a more apricot-type of orange, so this was definitely too intense. However, there was a bit of undyed top throughout, which managed to tone down the orange a bit. 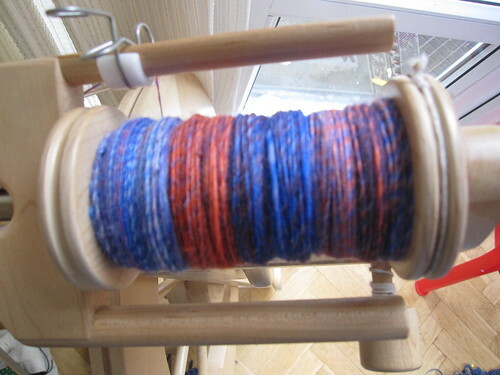 Plying helped too, pairing some of the orange with blue/purple. I'm hoping that it gets a bit more muted in the finished object too, but we'll see. Note to my mother: you are allowed to complain about how bright the orange is as long as you still wear it! * A present requested specifically, so I'm not giving anything** away by posting about it here. Written by porpoise On November 7, 2010 In "Christmas 2010", "dyeing", "handspun", "spinning"